French authorities Friday announced the man who attacked soldiers at Louvre Museum holds an Egyptian passport and arrived in France via the United Arab Emirates. Public Prosecutor in Paris François Molins indicated that the man applied for French visa in Dubai on October 30, 2016. He arrived in Paris on January 26 and was expected to leave the country on February 05. He added that the visitor rented an apartment in the 8th district of the French capital for 1,700 euros. Search of the apartment enabled security forces to discover €985 in cash, an iPad, an invoice of the two machetes used in the attack, two pouches matching the machetes, prepaid cards and an Egyptian passport with Saudi and Turkish visas issued respectively in 2015 and 2016. Security forces also discovered a car in the 8th district, reportedly rented by the man on January 27 until February 5th. He also reportedly bought the machetes on January 28 for €680, in the 11th district. Authorities are still trying to pull out the motive of the attack and whether he received orders. The attacker wounded one soldier at his scalp. He tried to butcher another soldier on the ground. The soldier shot back and injured him seriously, but the injuries are not life threatening. French President Francois Holland, attending EU summit in Malta, said the terrorist threat is still permanent, while his Premier Bernard Cazeneuve pointed out that the attack bears the marks of a terrorist attack. 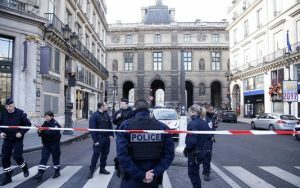 France suffered several terrorist attacks in 2015 and 2016. Around 238 people were killed. Written by: Peter Mulvany on February 4, 2017. Last revised by: Jaber Ali, our reviewer, on February 6, 2017. Posted by Peter Mulvany on Feb 4 2017. Filed under Headlines, World News. You can follow any responses to this entry through the RSS 2.0. Both comments and pings are currently closed.